This lake side cottage master bath was severely outdated and very taste specific to the previous owner with Art Deco lavender cabinets. It lacked storage, had a toilet in the center of the room with little privacy and a shower so narrow that the clients had difficulty standing under the steam of water from the shower head. See BEFORE photos. First on the list was to increase functional storage, provide privacy for the toilet, and increase the shower size. Then we chose a new round window, cabinets and fixtures to reflect the cottage charm of the home. 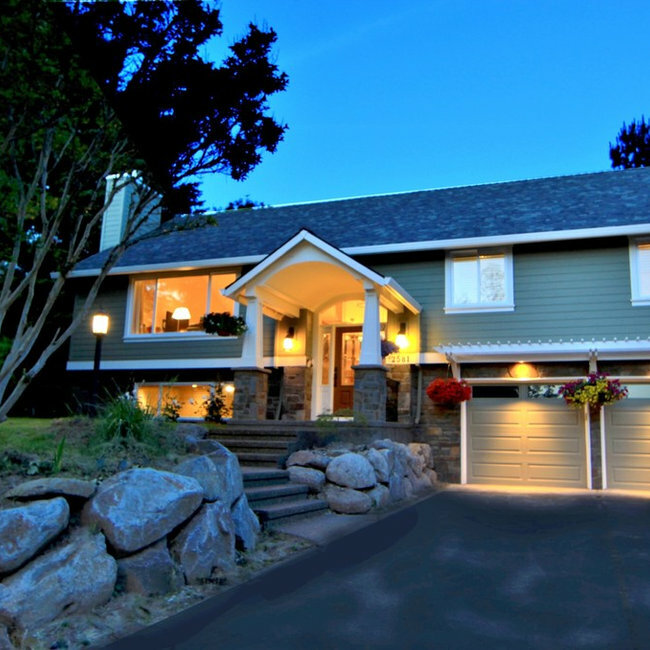 This home in the Portland hills was stuck in the 70's with cedar paneling and almond laminate cabinets with oak details. (See Before photos) The space had wonderful potential with a high vaulted ceiling that was covered by a low ceiling in the kitchen and dining room. Walls closed in the kitchen. The remodel began with removal of the ceiling and the wall between the kitchen and the dining room. Hardwood flooring was extended into the kitchen. 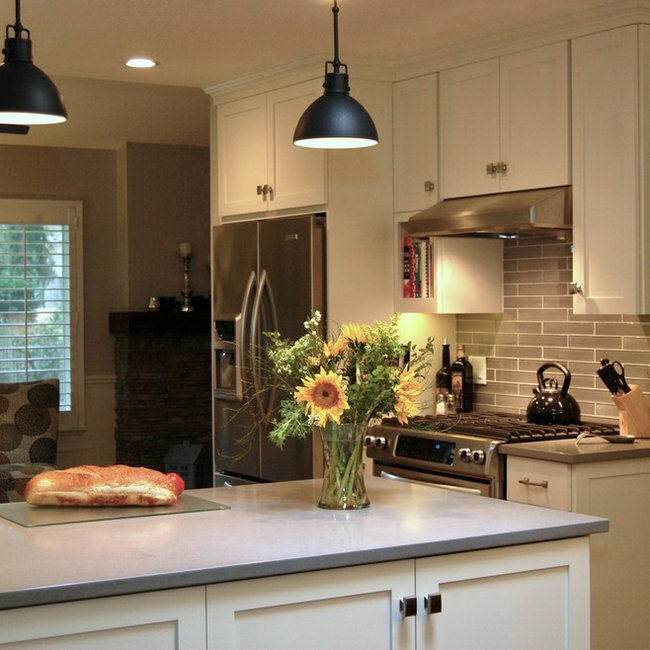 Shaker cabinets with contemporary hardware, modern pendants and clean-lined backsplash tile make this kitchen fit the transitional style the owners wanted. Now, the light and backdrop of beautiful trees are enjoyed from every room. A rear porch created a unique challenge with a change in ceiling height that could not be changed. The design embraced the ceiling height difference and accented the ceiling lines. New French doors replaced a small window allowing light to flood in. The old kitchen was closed off from the living room with a small swinging door. The opening was widened and new glass pocket doors installed that could close off the kitchen when needed. Thought was given to every detail for function and storage. 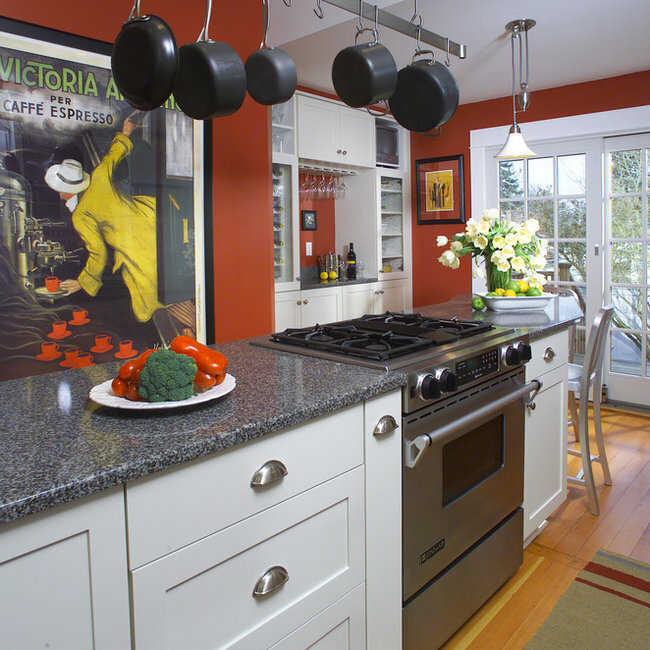 Stacked white Shaker cabinets with glass doors add charm to what was a dark and outdate space. This 1980's split level desperately needed a facelift. (See Before Photos) The entrance served its purpose, but certainly was not inviting. This 1980's split level desperately needed a facelift. My goal was to create a beautiful, & inviting porch. The remodel was extensive: new windows, siding, and roof replacement. The new siding has quarried stone below and a white horizontal band to draw the eye across and make the scale of the front proportional. The siding was painted a neutral green. The porch roof was barrel vaulted to high-light the front doorway and arched transom. An arbor adds visual interest with hanging flowers. 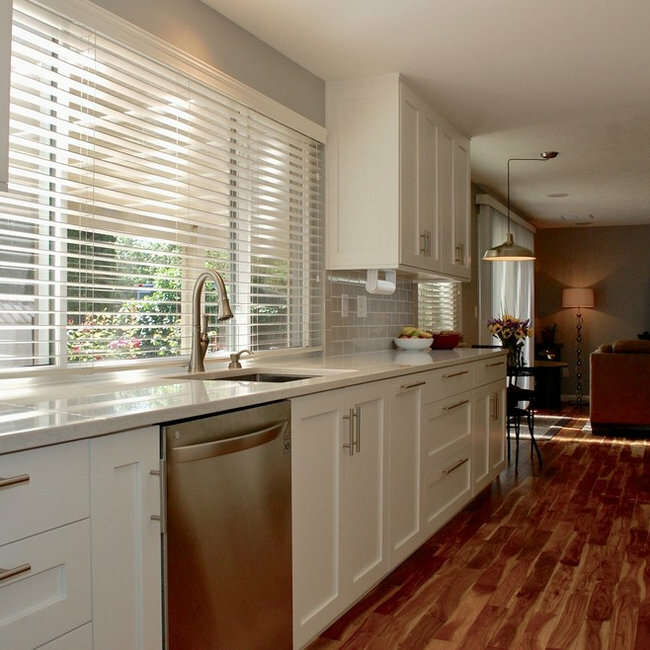 This active family purchased their home and began remodeling before moving in. The out-dated kitchen had oak cabinets and 4" orange tile on the countertops that had to go! (see before photos) It was replaced with a light and bright eat in kitchen. 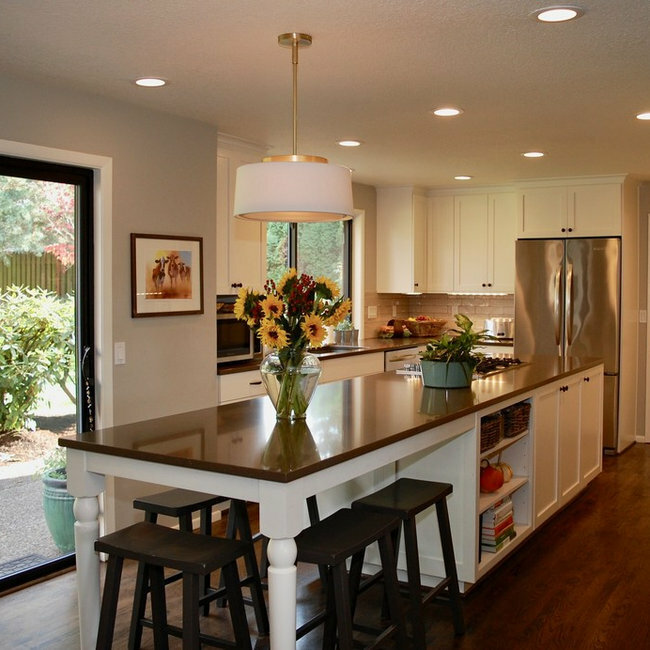 The expansive island provides ample counter space not only for baking and eating, but homework and crafts. 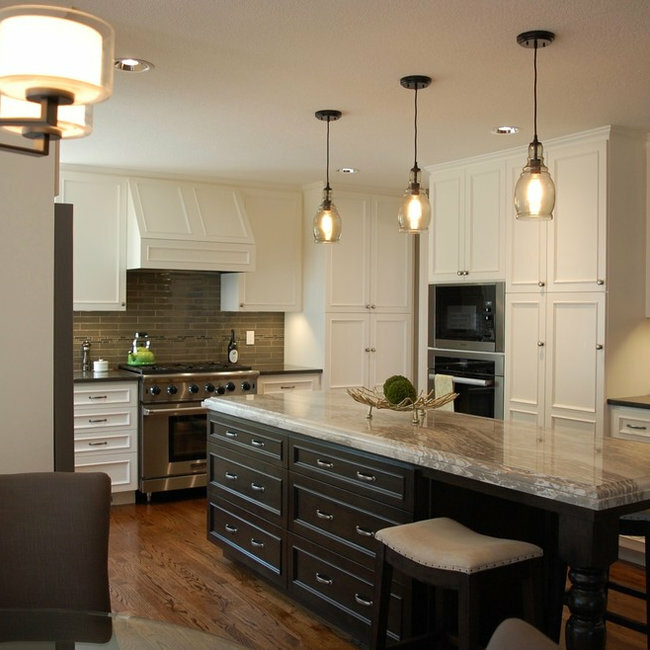 Cabinetry with convenient access to blind corners, thoughtful layout for function and storage created a kitchen that is truly the heart of their home. The laundry room is clean and fresh with larger cabinets and a relocated laundry sink under the window. The family room fireplace was also updated with new surround and custom bookcases. This 1928 home was designed in the Arts and Crafts style. To preserve the historic character of the home, design elements were taken from the existing home. The homeowners wanted to take advantage of views of the gardens, lake below and Mt. Hood in the distance-mission accomplished with walls of windows! The new addition included a 2nd entry, large kitchen, family room, breakfast nook, laundry, powder room and a mud room. Having lived in South America and Asia, cabinetry in every room was designed to display the treasures from their travels. This bathroom had to serve the needs of teenage twin sisters. The ceiling height in the basement was extremely low and the alcove where the existing vanity sat was reduced in depth so that the cabinetry & countertop had to be sized perfectly. 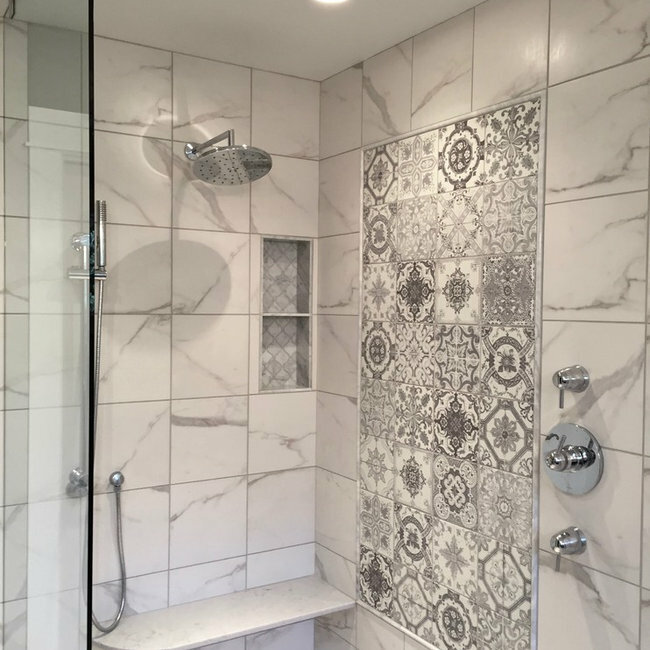 (See before Photos)The previous owner's had installed a custom shower and the homeowners liked the flooring and the shower itself. Keeping the tile work in place and working with the color palette provided a big savings. Now, this charming space provides all the storage needed for two teenage girls. This charming home had a kitchen with a very low ceiling and very little storage. (See BEFORE photos) Location of support beams required working within the existing footprint. Thinking outside the box created as much storage as possible. The homeowner wanted a table in the family room. A banquet flanked by two hutch-like cabinets for china, crystal and serving pieces provided charm and storage. The wall between the old dining room and kitchen was removed and a countertop with stools was added on this side. The final touch was updating the living room fireplace with a mantel and stacked field stone. 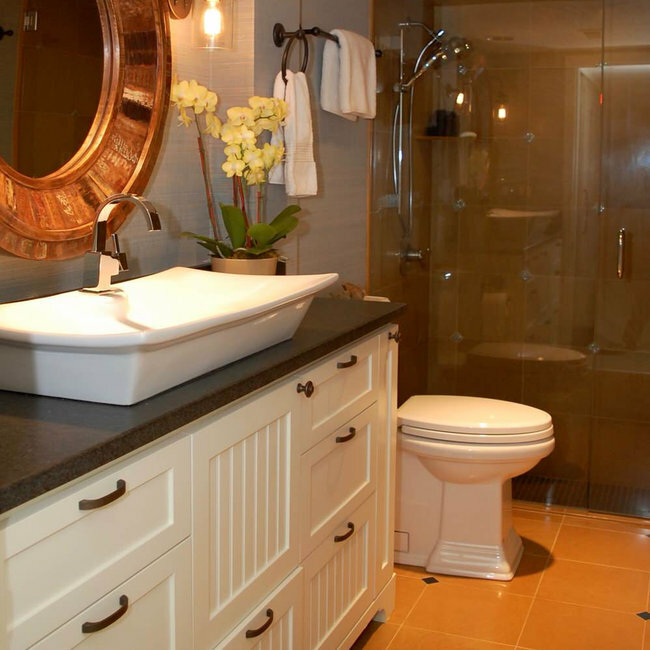 The homeowners created a charming space in their 1980's master bath. However, it did not function for their lifestyles with a huge deck mounted whirlpool tub and a small fiberglass shower (SEE BEFORE PHOTOS). Storage in the vanity was limited and the countertop was tiled. The homeowners wanted a bright and open bathroom with a large, custom walk-in shower with a bench. The vanity storage was maximized by the addition of bottom drawers in each sink base and a built in bench. Counter space was increased with under-mounted sinks. The new fixtures and additional lighting make this new bath fresh and inviting. The homeowner's had been living with inefficient and worn-out cabinetry in their 1970's ranch. 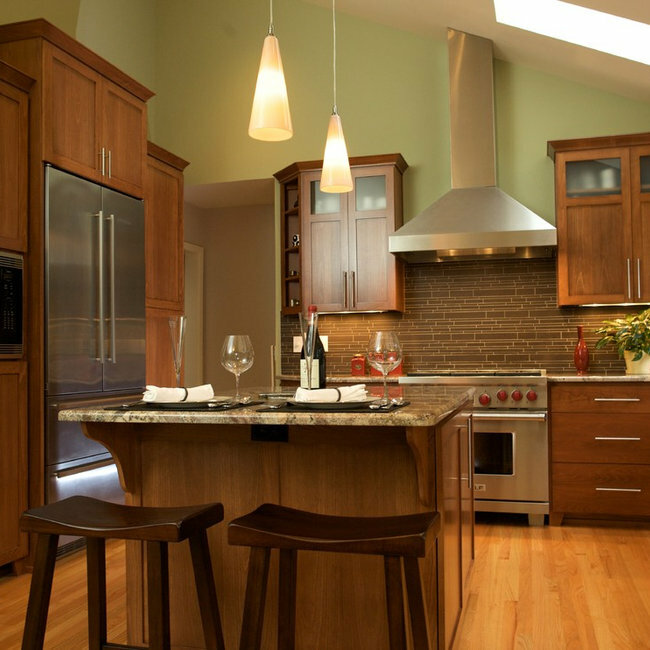 They had remodeled other spaces in their home and were now ready to take on their kitchen remodel themselves. 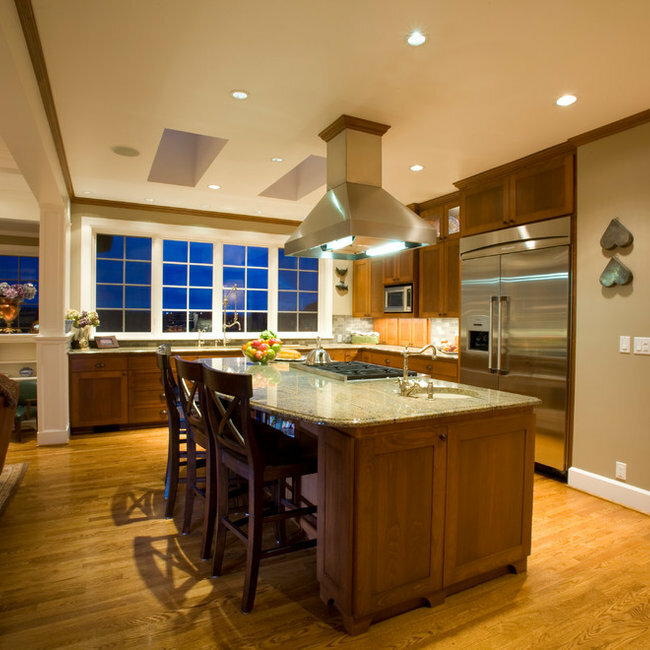 We found cabinetry that was well made and within their budget and developed a plan for the stages of their remodel. Appliances, lighting and fixtures remained in their original location. The cabinetry was fitted with robust storage solutions to organize everything in a functional layout. The vinyl flooring was replaced with beautiful hardwood. The dynamic pattern gives this kitchen a lovely focal point. The Butler's Pantry was a part of a historic remodel that included a large addition. The butler's pantry became the connection to the new living wing of the home making the visual aesthetic very important. The style needed to be formal and elegant but also warm and inviting. The bow window set at counter height expands the view from the existing dining room and floods the area with light through the new French doors. 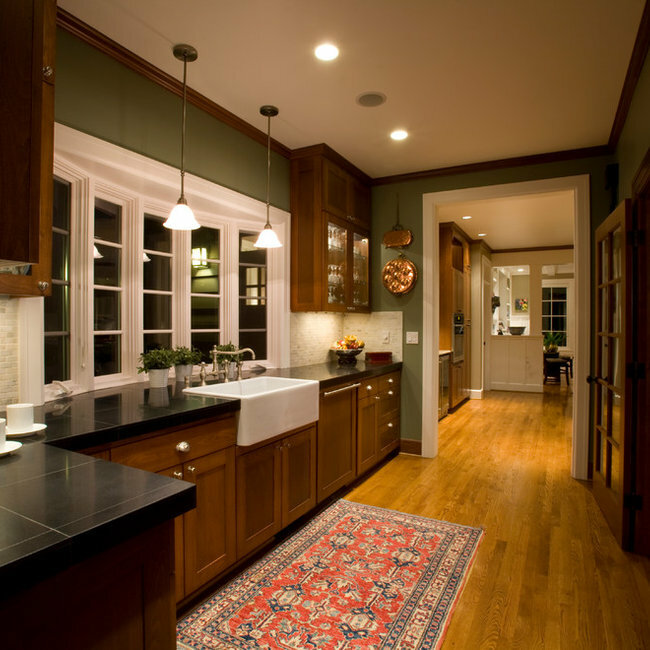 Lighted glass front cabinets add an openness and sparkle.